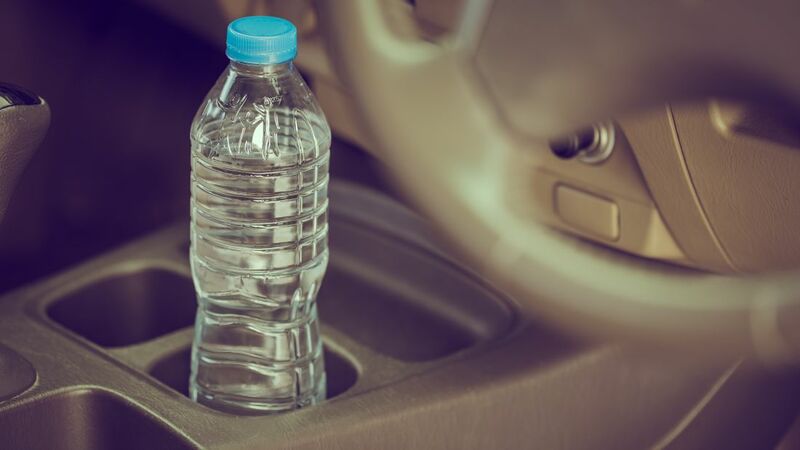 Leaving water bottles in your car during summer is a bad idea—and not just because chemicals from the plastic can leach into your water when it gets hot. A plastic bottle of water can set your car seat on fire if sunlight hits it at just the right angle, according to House Beautiful. If you don't believe that, just ask Dioni Amuchastegui, a battery technician with the Idaho Power Company. Amuchastegui was sitting in his truck during his lunch break when he saw some smoke out of the corner of his eye. He looked over “and noticed light was being refracted through a water bottle and was starting to catch the seat on fire,” Amuchastegui said in a Facebook video. He recorded the clip to warn others about the dangers of leaving plastic water bottles in hot cars. He tested it again, and a thermometer held up to the bottle registered a temperature of 213°F. The Midwest City Fire Department in Oklahoma conducted its own test and concluded that the dangers are very real. "Vinyl generally starts to burn at 455 degrees," David Richardson, of the fire department, tells CBS News. "It wouldn't take very long to start a fire if conditions were right—depends on how focused that beam of light is." Many people already avoid drinking from bottles left in cars—especially in the winter—due to a widely held belief that freezing or reusing plastic bottles can cause carcinogenic compounds to be released into the water. As Snopes reports, some of these claims are merely urban legends, but there may be some truth to the claim that heat can cause harmful phthalates (environmental contaminants) to leach into the water. The fact-checking agency rated this claim "undetermined." Regardless, the potential for kindling a fire should provide some incentive to clean out your car and remove any bottles that were tossed haphazardly into the backseat.